Not to be confused with the neighbouring Democratic Republic of the Congo or its antecedent, the Republic of the Congo-Léopoldville. "RotC" redirects here. For other uses, see ROTC (disambiguation). The Republic of the Congo ( pronunciation (help·info) French: République du Congo, Kongo: Repubilika ya Kôngo), also known as Congo-Brazzaville, the Congo Republic or simply the Congo, is a country located in the western coast of Central Africa. It is bordered by five countries: Gabon to its west; Cameroon to its northwest and the Central African Republic to its northeast; the Democratic Republic of the Congo to the southeast and the Angolan exclave of Cabinda to its south; and the Atlantic Ocean to its southwest. The region was dominated by Bantu-speaking tribes at least 3,000 years ago, who built trade links leading into the Congo River basin. Congo was formerly part of the French colony of Equatorial Africa. The Republic of the Congo was established on the 28th of November 1958 but gained independence from France in 1960. The sovereign state has had multi-party elections since 1992, although a democratically elected government was ousted in the 1997 Republic of the Congo Civil War, and President Denis Sassou Nguesso, who first came to power in 1979, has ruled for 33 of the past 38 years. The Republic of the Congo has become the fourth-largest oil producer in the Gulf of Guinea, providing the country with a degree of prosperity despite political and economic instability in some areas and unequal distribution of oil revenue nationwide. Congo's economy is heavily dependent on the oil sector, and economic growth has slowed considerably since the post-2015 drop in oil prices. Bantu-speaking peoples who founded tribes during the Bantu expansions largely displaced and absorbed the earliest inhabitants of the region, the Pygmy people, about 1500 BC. The Bakongo, a Bantu ethnic group that also occupied parts of present-day Angola, Gabon, and the Democratic Republic of the Congo, formed the basis for ethnic affinities and rivalries among those countries. Several Bantu kingdoms—notably those of the Kongo, the Loango, and the Teke—built trade links leading into the Congo River basin. The Portuguese explorer Diogo Cão reached the mouth of the Congo in 1484. Commercial relationships quickly grew between the inland Bantu kingdoms and European merchants who traded various commodities, manufactured goods, and people captured from the hinterlands. After centuries as a major hub for transatlantic trade, direct European colonization of the Congo river delta began in the late 19th century, subsequently eroding the power of the Bantu societies in the region. The area north of the Congo River came under French sovereignty in 1880 as a result of Pierre de Brazza's treaty with King Makoko of the Bateke. This Congo Colony became known first as French Congo, then as Middle Congo in 1903. In 1908, France organized French Equatorial Africa (AEF), comprising Middle Congo, Gabon, Chad, and Oubangui-Chari (the modern Central African Republic). 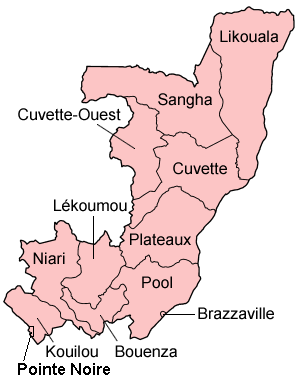 The French designated Brazzaville as the federal capital. Economic development during the first 50 years of colonial rule in Congo centered on natural-resource extraction. The methods were often brutal: construction of the Congo–Ocean Railroad following World War I has been estimated to have cost at least 14,000 lives. During the Nazi occupation of France during World War II, Brazzaville functioned as the symbolic capital of Free France between 1940 and 1943. The Brazzaville Conference of 1944 heralded a period of major reform in French colonial policy. Congo benefited from the postwar expansion of colonial administrative and infrastructure spending as a result of its central geographic location within AEF and the federal capital at Brazzaville. It also received a local legislature after the adoption of the 1946 constitution that established the Fourth Republic. Following the revision of the French constitution that established the Fifth Republic in 1958, the AEF dissolved into its constituent parts, each of which became an autonomous colony within the French Community. During these reforms, Middle Congo became known as the Republic of the Congo in 1958 and published its first constitution in 1959. Antagonism between the Mbochis (who favored Jacques Opangault) and the Laris and Kongos (who favored Fulbert Youlou, the first black mayor elected in French Equatorial Africa) resulted in a series of riots in Brazzaville in February 1959, which the French Army subdued. Alphonse Massamba-Débat's one-party rule (1963–1968) attempted to implement a political economic strategy of "scientific socialism"
The Republic of the Congo received full independence from France on 15 August 1960. Youlou ruled as the country's first president until labour elements and rival political parties instigated a three-day uprising that ousted him. The Congolese military briefly took charge of the country, and installed a civilian provisional government headed by Alphonse Massamba-Débat. Under the 1963 constitution, Massamba-Débat was elected President for a five-year term. During Massamba-Débat's term in office the regime adopted "scientific socialism" as the country's constitutional ideology. In 1965, Congo established relations with the Soviet Union, the People's Republic of China, North Korea and North Vietnam. Massamba-Débat's regime also invited several hundred Cuban army troops into the country to train his party's militia units and these troops helped his government survive a coup d'état in 1966 led by paratroopers loyal to future President Marien Ngouabi. Nevertheless, Massamba-Débat was unable to reconcile various institutional, tribal and ideological factions within the country and his regime ended abruptly with a bloodless coup in September 1968. Marien Ngouabi changed the country's name to the People's Republic of the Congo, declaring it to be Africa's first Marxist–Leninist state. He was assassinated in 1977. 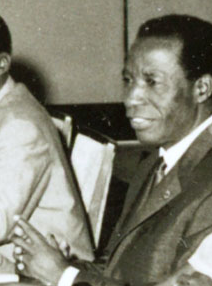 Ngouabi, who had participated in the coup, assumed the presidency on 31 December 1968. One year later, President Ngouabi proclaimed Congo Africa's first "people's republic", the People's Republic of the Congo, and announced the decision of the National Revolutionary Movement to change its name to the Congolese Labour Party (PCT). He survived an attempted coup in 1972 but was assassinated on 16 March 1977. An 11-member Military Committee of the Party (CMP) was then named to head an interim government, with Joachim Yhombi-Opango to serve as President of the Republic. Two years later, Yhombi-Opango was forced from power and Denis Sassou Nguesso become the new president. Sassou Nguesso aligned the country with the Eastern Bloc and signed a twenty-year friendship pact with the Soviet Union. Over the years, Sassou had to rely more on political repression and less on patronage to maintain his dictatorship. Pascal Lissouba, who became Congo's first elected president (1992–1997) during the period of multi-party democracy, attempted to implement economic reforms with IMF backing to liberalize the economy. In June 1996, the IMF approved a three-year SDR69.5m (US$100m) enhanced structural adjustment facility (ESAF) and was on the verge of announcing a renewed annual agreement when civil war broke out in Congo in mid-1997. Congo's democratic progress was derailed in 1997, when Lissouba and Sassou started to fight for power in the civil war. As presidential elections scheduled for July 1997 approached, tensions between the Lissouba and Sassou camps mounted. On 5 June, President Lissouba's government forces surrounded Sassou's compound in Brazzaville and Sassou ordered members of his private militia (known as "Cobras") to resist. Thus began a four-month conflict that destroyed or damaged much of Brazzaville and caused tens of thousands of civilian deaths. In early October, the Angolan régime began an invasion of Congo to install Sassou in power. In mid-October, the Lissouba government fell. Soon thereafter, Sassou declared himself president. In the controversial elections in 2002, Sassou won with almost 90% of the vote cast. His two main rivals, Lissouba and Bernard Kolelas, were prevented from competing and the only remaining credible rival, André Milongo, advised his supporters to boycott the elections and then withdrew from the race. A new constitution, agreed upon by referendum in January 2002, granted the president new powers, extended his term to seven years, and introduced a new bicameral assembly. International observers took issue with the organization of the presidential election and the constitutional referendum, both of which were reminiscent in their organization of Congo's era of the one-party state. Following the presidential elections, fighting restarted in the Pool region between government forces and rebels led by Pastor Ntumi; a peace treaty to end the conflict was signed in April 2003. Sassou also won the following presidential election in July 2009. According to the Congolese Observatory of Human Rights, a non-governmental organization, the election was marked by "very low" turnout and "fraud and irregularities". In March 2015 Sassou announced that he wanted to run for yet another term in office and a constitutional referendum in October resulted in a changed constitution which allowed him to run during the 2016 presidential election. He won the election believed by many to be fraudulent. After violent protests in the capital, Sassou attacked the Pool region, where the Ninja rebels of the civil war used to be based, in what was believed to be a distraction. This led to a revival of the Ninja rebels who launched attacks against the army in April 2016, leading 80,000 people to flee their homes. A ceasefire deal was signed in December 2017. Denis Sassou Nguesso served as President from 1979 to 1992 and has remained in power ever since his rebel forces ousted President Pascal Lissouba during the 1997 Civil War. Congo-Brazzaville has had a multi-party political system since the early 1990s, although the system is heavily dominated by President Denis Sassou Nguesso; he has lacked serious competition in the presidential elections held under his rule. Sassou Nguesso is backed by his own Congolese Labour Party (French: Parti Congolais du Travail) as well as a range of smaller parties. Sassou's regime has been hit by corruption revelations despite attempts to censor them. One French investigation found over 110 bank accounts and dozens of lavish properties in France; Sassou denounced embezzlement investigations as "racist" and "colonial". Denis Christel Sassou-Nguesso, son of Denis Sassou Nguesso, has been named in association with the Panama Papers. Many Pygmies belong from birth to Bantus in a relationship many refer to as slavery. The Congolese Human Rights Observatory says that the Pygmies are treated as property the same way "pets" are. On 30 December 2010, the Congolese parliament adopted a law for the promotion and protection of the rights of indigenous peoples. This law is the first of its kind in Africa, and its adoption is a historic development for indigenous peoples on the continent. 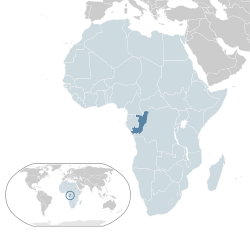 Congo is located in the central-western part of sub-Saharan Africa, along the Equator, lying between latitudes 4°N and 5°S, and longitudes 11° and 19°E. To the south and east of it is the Democratic Republic of the Congo. It is also bounded by Gabon to the west, Cameroon and the Central African Republic to the north, and Cabinda (Angola) to the southwest. It has a short coast on the Atlantic Ocean. The southwest of the country is a coastal plain for which the primary drainage is the Kouilou-Niari River; the interior of the country consists of a central plateau between two basins to the south and north. Forests are under increasing exploitation pressure. Since the country is located on the Equator, the climate is consistent year-round, with the average day temperature a humid 24 °C (75 °F) and nights generally between 16 °C (61 °F) and 21 °C (70 °F). The average yearly rainfall ranges from 1,100 millimetres (43 in) in the Niari Valley in the south to over 2,000 millimetres (79 in) in central parts of the country. The dry season is from June to August, while in the majority of the country the wet season has two rainfall maxima: one in March–May and another in September–November. In 2006–07, researchers from the Wildlife Conservation Society studied gorillas in heavily forested regions centered on the Ouesso district of the Sangha Region. They suggest a population on the order of 125,000 western lowland gorillas, whose isolation from humans has been largely preserved by inhospitable swamps. In the early 1980s, rapidly rising oil revenues enabled the government to finance large-scale development projects with GDP growth averaging 5% annually, one of the highest rates in Africa. The government has mortgaged a substantial portion of its petroleum earnings, contributing to a shortage of revenues. 12 January 1994 devaluation of Franc Zone currencies by 50% resulted in inflation of 46% in 1994, but inflation has subsided since. Economic reform efforts continued with the support of international organizations, notably the World Bank and the International Monetary Fund. The reform program came to a halt in June 1997 when civil war erupted. When Sassou Nguesso returned to power at the end of the war in October 1997, he publicly expressed interest in moving forward on economic reforms and privatization and in renewing cooperation with international financial institutions. However, economic progress was badly hurt by slumping oil prices and the resumption of armed conflict in December 1998, which worsened the republic's budget deficit. The current administration presides over an uneasy internal peace and faces difficult economic problems of stimulating recovery and reducing poverty, despite record-high oil prices since 2003. Natural gas and diamonds are also recent major Congolese exports, although Congo was excluded from the Kimberley Process in 2004 amid allegations that most of its diamond exports were in fact being smuggled out of the neighboring Democratic Republic of the Congo; it was re-admitted to the group in 2007. The Republic of the Congo also has large untapped base metal, gold, iron and phosphate deposits. The country is a member of the Organization for the Harmonization of Business Law in Africa (OHADA). The Congolese government signed an agreement in 2009 to lease 200,000 hectares of land to South African farmers to reduce its dependence on imports. Transport in the Republic of the Congo includes land, air and water transportation. The country's rail system was built by forced laborers during the 1930s and largely remains in operation. There are also over 1000 km of paved roads and two major international airports (Maya-Maya Airport and Pointe Noire Airport) which have flights to destinations in Europe, Africa, and the Middle East. The country also has a large port on the Atlantic Ocean at Pointe-Noire and others along the Congo River at Brazzaville and Impfondo. According to CIA World Factbook, the people of the Republic of the Congo are largely a mix of Catholics (33.1%), Awakening Lutherans (22.3%) and other Protestants (19.9%). Followers of Islam make up 1.6%, and this is primarily due to an influx of foreign workers into the urban centers. As of 2010[update], the maternal mortality rate was 560 deaths/100,000 live births, and the infant mortality rate was 59.34 deaths/1,000 live births. Female genital mutilation (FGM) is rare in the country, being confined to limited geographic areas of the country. Tourism remains a very marginal resource in the Congo, reception facilities based out of Pointe-Noire and Brazzaville lack a sufficient and consistent communications network. Many sites are difficult to visit but, paradoxically, some of the South's most populous and developed locations are often the least accessible. For example, the massive Chaillu Mountains are almost impossible to visit. The Republic of Congo has several writers recognised in Africa and the French-speaking world: Alain Mabanckou, Jean-Baptiste Tati Loutard Jeannette Ballou Tchichelle, Henri Lopes, Lassy Mbouity and Tchicaya U Tam'si. The country has universities. At university, students can obtain a bachelor's degree in three years and a master's after four. Marien Ngouabi University—which offers courses in medicine, law, and other fields—is the country's only public university. ^ a b c d "Republic of the Congo". International Monetary Fund. Retrieved 25 July 2017. ^ "GINI index". World Bank. Retrieved 12 September 2015. ^ SEWELL CHAN, MADELEINE KRUHLY & HANNAH OLIVENNES (12 May 2016). "Congo Republic". ^ a b c d "Congo, Republic of the". CIA – The World Factbook. ^ a b c d e "Background Note: Republic of the Congo". Department of State. March 2009. ^ a b c Olson, James S. & Shadle, Robert. Historical Dictionary of European Imperialism, p. 225. Greenwood Publishing Group, 1991. ISBN 0-313-26257-8. Accessed 9 October 2011. ^ "BBC NEWS – Africa – The man who would be Congo's king". 2003-02-12. ^ United States State Department. Office of the Historian. A Guide to the United States' History of Recognition, Diplomatic, and Consular Relations, by Country, since 1776. "Republic of the Congo". Accessed 9 October 2010. ^ United States State Department. Bureau of African Affairs. Background Notes. "Republic of the Congo". Accessed 9 October 2011. ^ Robbers, Gerhard (2007). Encyclopedia of World Constitutions. Infobase Publishing. ISBN 0-8160-6078-9. Accessed 9 October 2011. ^ "Fulbert Youlou facts, information, pictures – Encyclopedia.com articles about Fulbert Youlou". ^ Country Report Congo-Brazzaville. The Economist Intelligence Unit. 2003. p. 24. ^ "Congo, Republic of". Freedom House. 2006. Retrieved 12 June 2009. ^ "Congo approves new constitution". BBC. 24 January 2002. Retrieved 12 June 2009. ^ "Congo peace deal signed". BBC. 18 March 2003. Retrieved 15 June 2009. ^ "17 candidates in Congo presidential race: commission". AFP. 13 June 2009. Retrieved 15 June 2009. ^ Vote results expected as opposition alleges fraud Archived 27 July 2009 at the Wayback Machine. France24 (16 July 2009). ^ "Congo-Brazzaville's hidden war". New Humanitarian. 18 June 2018. Retrieved 7 April 2019. ^ "Congo leader son fails in gag bid". BBC. 15 August 2007. ^ "Propping Up Africa's Dictators". Foreign Policy In Focus. 22 June 2009. Archived from the original on 12 October 2009. ^ "FACTBOX-African leaders' French assets under scrutiny". Reuters. 29 April 2009. Archived from the original on 4 February 2012. ^ Joan Tilouine; ICIJ (4 April 2016). "Les Africains du Panama (1) : les circuits offshore des " fils de "". Le Monde (in French). ^ "Congo opposition holds ceremony for killed protesters=Reuters". Reuters. 2015-10-30. ^ lefigaro.fr (4 April 2016). "Violences au Congo : le government accuse les opposants à Sassou-Nguesso". Le Figaro (in French). Retrieved 1 June 2016. ^ a b "Pygmies in the Congo treated like "pets": report". globalpost.com. 13 July 2014. Retrieved 13 November 2011. ^ Thomas, Katie (4 March 2007). "Slaves of the Congo". International Reporting Project. Retrieved 13 July 2014. The site of the Presidency of the Republic of the Congo lists 11 departments, 7 communes, and 76 districts. ^ Map: Situation de l'exploitation forestière en République du Congo. (PDF) . Retrieved on 25 February 2013. ^ Samba G.; Nganga D.; Mpounza M. (2008). "Rainfall and temperature variations over Congo-Brazzaville between 1950 and 1998". Theoretical and Applied Climatology. 91 (1–4): 85–97. Bibcode:2008ThApC..91...85S. doi:10.1007/s00704-007-0298-0. Retrieved 11 June 2008. ^ "'Mother Lode' Of Gorillas Found In Congo Forests : NPR". Retrieved 15 August 2008. ^ "Congo-Brazzaville". Energy Information Administration, U.S. Government. Archived from the original on 23 March 2008. Retrieved 11 June 2009. ^ "Congo, Republic of". EconStats. Retrieved 11 June 2009. ^ "Kimberley Process Removes the Republic of Congo from the List of Participants". Kimberley Process. 9 July 2004. Archived from the original on 10 May 2009. Retrieved 11 June 2008. ^ "2007 Kimberley Process Communiqué". Kimberley Process. 8 November 2007. Archived from the original on 4 March 2008. Retrieved 11 June 2008. ^ "Mining in Congo". MBendi. Archived from the original on 27 December 2016. Retrieved 14 June 2009. ^ Goodspeed, Peter (21 October 2009) "South Africa's white farmers prepare to trek to the Congo". Archived from the original on 18 February 2011. Retrieved 10 September 2016. . National Post. ^ Congo hands land to South African farmers. Telegraph. 21 October 2009. ^ "Republic of the Congo GDP and Economic Data". Global Finance. Retrieved 14 January 2016. ^ "OPEC Member Countries". Organization of Petroleum Exporting Countries. Retrieved 20 January 2019. ^ "Table: Christian Population as Percentages of Total Population by Country". Pew Research Center's Religion & Public Life Project. 19 December 2011. ^ a b c Background Note: Republic of the Congo United States Department of State. Accessed on 21 August 2008. ^ "Languages of Congo". SIL International. Retrieved 13 June 2009. ^ Levinson, David (1998). Ethnic groups worldwide. Greenwood Publishing Group. pp. 120–121. ISBN 978-1-57356-019-1. ^ "Congo Overview". Minority Rights Group International. Retrieved 13 June 2009. ^ "Les pygmées du Congo en "danger d'extinction"". Le Monde. 5 August 2011. Retrieved 5 November 2017. ^ "IRIN Africa – CONGO: Grappling with malnutrition and post-conflict woes – Congo – Food Security – Health & Nutrition". IRINnews. 2007-08-08. Retrieved 23 January 2015. ^ "CONGO (BRAZZAVILLE): UNFPA Leads Fight Against FGM " UNFPA in the News". Archived from the original on 29 November 2014. Retrieved 23 January 2015. ^ a b Refworld | 2008 Findings on the Worst Forms of Child Labor – Congo, Republic of the Archived 10 May 2011 at the Wayback Machine. UNHCR. Retrieved on 25 February 2013. "Republic of the Congo". The World Factbook. Central Intelligence Agency. Review of Congo by the United Nations Human Rights Council's Universal Periodic Review, 6 May 2009.